This traditional origami windmill model is better known as Pinwheel in the USA. 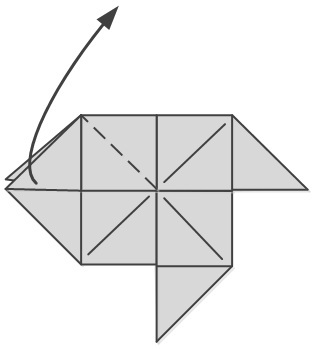 It’s another one of those designs that a lot of people will be familiar with from their childhood, but might not immediately recognise as origami, simply because they’ve never thought about it that way. It’s very simple to make and takes less than five minutes. 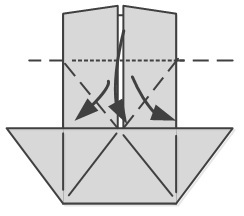 The origami windmill is a great model for beginners or children to fold. If you attach the finished paper pinwheel to a stick or a length of dowling rod it will spin round in the wind quite successfully. If you do intend to do this, use some quite thick paper so that it doesn’t get destroyed in the first puff of wind. The more colourful the paper you can find, the better! I’ve made this windmill out of gold foil paper. Why not try making several paper pinwheels and arranging them at different heights in a plant pot? Just remember to bring them inside when it rains. I will be writing about how to preserve origami models in a later post. Paper: Something reasonably thick and brightly coloured! Time to fold: About 5 minutes. 8. Squash fold the bottom: open up the layers at the bottom and fold the sides out along the creases made in the previous step. 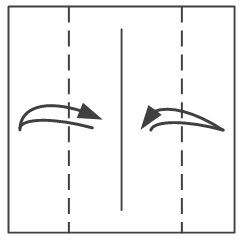 The bottom edge will automatically want to fold up to the middle line. See the next picture for the result. 9. Repeat the squash fold at the top. 10. 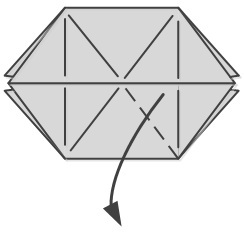 Fold the bottom right flap down so the edge lies along the centre crease. 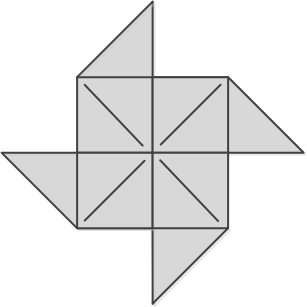 To make the origami pinwheel spin, push a map pin through the centre and attach it to a stick or a length of wooden dowling rod. The origami windmill will spin if you tap it with your finger, blow on it, or take it outside if there is a light breeze. I’d love to hear your views on this origami windmill/pinwheel or any other beginner origami models. Feel free to let me know what you think in the comments below, or you find can me on Instagram or Twitter. Check out my Pinterest boards too!